Will we remember this as the month of Rhys Hoskins and the unofficial start of the next Phillies champion? 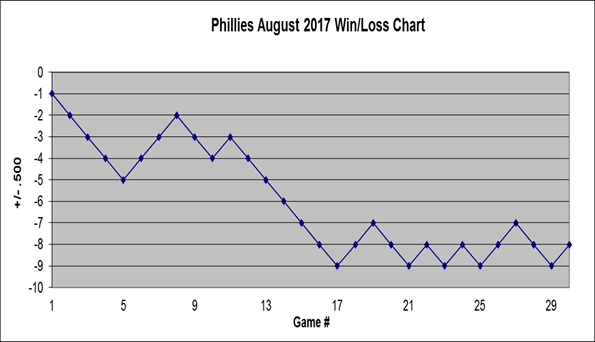 August was a fun month to be a Phillies fan. Not in terms of wins and losses. Oh God no. They lost the first five games of the month, went on another six-game losing streak, and lost 9 of the first 13 games of the month. It was also an awful month in terms of injuries. Eflin, Altherr, Herrera, and Nava all went on the DL, a finger issue for Velasquez ended his season, and it's possible the same will be true for Jerad Eickhoff. But there was a lot to smile about. For the first time since this rebuild started, we can begin to see how this roster will shape up. Rhys Hoskins joined his Lehigh teammates Nick Williams and Jorge Alfaro, with young pieces like Herrera and Altherr already here. And let's not forget J.P. Crawford playing third base with a real shot to join the team, and Kingery lurking for next season. It should make for an exciting final month. Began month: 39-64, 19.5 games behind 1st place Nationals & 8.5 games behind 3rd place Braves. Finished month: 50-83, 31 games behind 1st place Nationals & 8 games behind 4th place Mets. 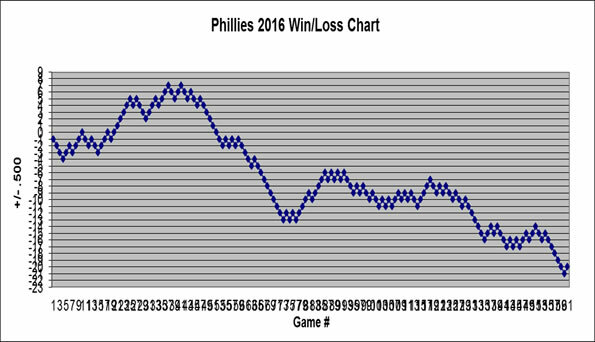 Game 1: Nola escaped with just two runs in 6 innings despite 8 hits, but bullpen allowed 5 runs and Phils struggled with RISP in 7-1 loss. Game 2: Thompson surrendered 3 homers and 7 runs (2 earned) in 3rd inning and Phils were shutout 7-0. Game 1: Velasquez escaped with just 2 runs in 5 long innings, but a homer off Pinto in the 7th tied game and a run off Garcia in 8th gave Phils 4th straight loss. Game 2: Rockies score 8 times off Pivetta in 2.2 innings and Nava's 3-run homer late not nearly enough in 8-5 loss. Game 3: Nola allows just 2 runs in seven innings and Phils were down 2-1 in the ninth when Rupp hit game-winning double in 3-2 win. Game 1: In Eflin's return from minors, he allowed 2 runs in seven innings, while Odubel Herrera's 2-run golf homer in the 5th helped Phils to 5-2 win. Game 1: Velasquez allows 3 runs and leaves after 1st with numbness in middle finger and Phils no match for deGrom in 10-0 shutout loss. Rhys Hoskins makes MLB debut in LF. Game 2: Phils score 3 times in first, but Pivetta allowed two homers and 6 runs in 4.2 innings. Hernandez homered to tie game at 6 in 8th, but Neris allowed homer in 9th in 7-6 loss. Game 3: Nola with another dominant performance, pitching seven innings with just one run on two hits. Phils scored 2 runs in fifth and added insurance run in 8th in 3-1 win. Game 4: Eflin allowed 4 runs in 5.1 innings, but Phils only scored twice and a rally was cut short when Herrera tagged and went to an occupied 3rd base. Hoskins got first MLB hit and RBI in 6-2 loss. Game 1: Hoskins hits 1st and 2nd career homers and Eickhoff battled with 2 runs through five innings, but Pinto allowed 5 runs in 2 innings in 7-4 loss. Game 2: Leiter allowed 8 runs in 5 innings, but only 4 were earned with 2 errors and other misplays. Hoskins homered again and Alfaro hit first MLB homer in 8-4 loss. Game 3: Pivetta struck out 8 of the first nine batters he faced, but allowed 3 runs and couldn't record an out in 6th inning, while Phils were shutout on 3 hits by one of worst starters in baseball. Game 1: Nola's streak of 10 games with 6+ innings and 2 or less runs end, as he allows 5 in 5 innings, while Rupp and Williams homered in 5-4 loss. Game 2: Eflin allows 6 runs against in first 3 innings and leaves after 5 with shoulder soreness. Phillies mustered just 2 hits off Matt Moore with 5+ ERA in 7.1 innings in 10-2 loss. Game 3: Ty Kelly's pinch-hit grand slam finished off 7-run sixth. Eickhoff allowed 4 runs in 4.2 and Ramos allowed 5 runs in ninth, but they held on in 12-9 win. Game 4: Lively allowed 2 runs in 6 innings, and a 3-run 8th helped Phils to 5-2 victory. Game 1: Phils hit 4 homers, but it was not enough as Nola allowed 7 runs and 3 homers in 6.1 innings in 8-2 loss in game 1 of doubleheader. Game 2: Pivetta throws 44 pitches in first and last just 1.1 innings with 6 runs allowed. Phils hit three more homers, but lose 7-4 in game 2. Game 3: Leiter carried no hitter into sixth inning and allowed just 1 hit in 7 innings, while Hoskins homered, doubled, and knocked in 5 in 8-0 win. Game 4: Homers by Hoskins and Joseph helped Phils to 8-3 lead after 4, but Thompson allowed 5 runs in 5 innings and bullpen allowed 4 more, including inside-the-parker in 9-8 loss. Game 1: Phils score 6 times in first two innings behind Hoskins MLB record 9th homer in first 16 games and bases clearly triple by Hernandez, while Eickhoff allowed 1 run in 5 innings and bullpen gave up nothing in 7-1 win. Game 2: Hoskins homers again to become quickest to 10 homers, but Lively tagged for 6 runs in 5 innings and bullpen allows 11 more in 17-2 defeat. Game 3: Pivetta allowed 3 runs in 38-pitch 1st but allowed no more in 5 innings, while Williams' homer capped 5-run 5th. Hoskins homered again and started triple play in 6-3 win. Game 1: Hoskins homer streak ends, but Phils scored 6 times and Nola allows just one run on 5 hits in 7 innings in 6-1 win. Game 2: Eickhoff allowed 6 runs in 2 innings before leaving with injury and Phils scored just one run off Dickey in 9-1 loss in game 1 of doubleheader. Game 3: Leiter was solid with 3 runs in 6.2 innings, but Phils got just 6 hits in 5-2 loss in doubleheader sweep. Game 1: Lively gave up 2 runs in six innings and drove in 2 in decisive 4th inning in 3-2 win. August 2 - Phillies announced that Pete Rose will not participate in alumni weekend. August 5 - Mark Leiter struck out nine batters in 4 1/3 relief innings, the highest strikeout total by a Phillies reliever since Lowell Palmer in 1970. He is the sixth reliever in MLB history to fan nine or more without giving up a run or walk. August 6 - Former catcher Darren Daulton passed away at age 55 following a four-year battle with brain cancer. 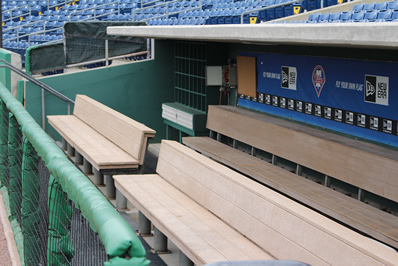 August 10 - Rhys Hoskins makes MLB debut in left field. August 15 - Jorge Alfaro hits first MLB homer, measured at 114.2 mph. August 17 - Nola's streak of 10 games with 6+ innings and 2 or less runs ended. August 27 - Rhys Hoskins homered again to become quickest to 11 homers in MLB. He also started a triple play. August 31 - The Phillies claimed right-handed reliever Juan Nicasio off waivers from the Pirates. Which Phillies do you think will be traded this offseason?